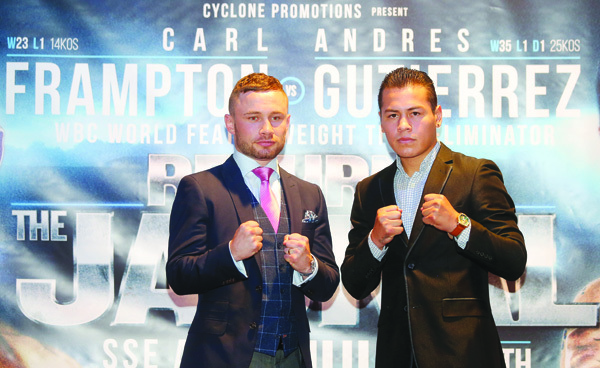 IT’S not the Mexican opposition Carl Frampton was hoping for as he makes his first appearance at home in over two years, but Andres Gutierrez will be the man aiming to silence the Belfast fans at the SSE Arena on July 29. Frampton had been hoping to lure Leo Santa Cruz over to complete the trilogy between the pair after the Mexican evened the score in Las Vegas back in January, capturing the WBA featherweight title had taken from him in New York last summer, but the Mexican did not play ball and stick to his pre-fight promise to travel across the Atlantic. Instead, 23 year-old Gutierrez accepted the challenge for this WBC eliminator. It was expected Frampton’s homecoming bout would take place at Windsor Park, but with the Women’s U19 European Championships being held in the stadium just over a week later, it was not possible for Frampton to fulfil his dream of boxing at the South Belfast venue for now. “I just want to say I’m really sorry because people will miss out on tickets,” said ‘The Jackal’ at Wednesday’s press conference at the Europa Hotel. While it may not be the venue he had hoped for on this occasion, Frampton will feel right back at home at the SSE Arena that had earned the nickname of ‘The Jackal’s Den’ given the raucous atmosphere generated by his fans. Frampton’s last outing there was his destruction of Chris Avalos in his first defence of the IBF super-bantamweight title in February 2015 before four fights on the road, so he is excited to get back to familiar territory. “I’m very excited to be boxing at home again. I believe that my best performances are when I box at home,” he added. “I think a lot of people were expecting this would be at Windsor Park. I was hoping it would be at Windsor Park, but it wasn’t to be this time for a few reasons. My dream is to fight at Windsor Park and I hope to do that at some point in time. “The Odyssey is where I believe my performance in my career has been against Chris Avalos. I think that the atmosphere in there can’t be replicated anywhere else. I think when you go outside, sometimes you lose the noise into the sky, but the atmosphere in the Odyssey is spectacular and I can’t wait to get going again. Former WBC featherweight Silver champion Gutierrez will certainly provide that test. The Guadalajara native has a record of 35-1-1 with his sole defeat a controversial majority decision loss to Cristian Mijares last summer and looked naturally bigger beside the Belfast favourite on Wednesday. The Mexican and his trainer, Jorge Barrera – brother of ring legend Marco Antonio – were afforded a generous reception by the large crowd at the Europa, but Gutierrez knows it will be much more hostile on July 29 although he seemed unfazed and claims he is ready to take his big opportunity. “I am ready for this fight,” he declared. “I know I have lost a fight, but I felt I won that fight. I know I will need to be at my best, but I want to give a good show to everyone. I have been training hard for this opportunity and I want to show that. Frampton’s manager, Barry McGuigan believes this is the perfect opponent for his man to get back in the groove following his disappointment in Las Vegas. Victory will leave him in a great position with a path to WBC champion, Gary Russell Jnr while fights against IBF champion Lee Selby and of course, Santa Cruz remain real possibilities, but McGuigan warned that Frampton must not look past the big-punching Gutierrez or his hopes of getting his hands on a world title again could fade away. “We wanted Carl to have a serious test and we certainly have got that in Andres Gutierrez,” said McGuigan. “This guy is a no-nonsense fighter, an attacking fighter with a tremendous punch. He is just a whirlwind who never leaves you alone. We felt that Carl needed an opponent like that to get him back to his sharp best and we certainly believe that is going to happen. The fans are really going to be excited about this fight because it’s going to be action packed from start to finish. McGuigan admitted that matching Frampton was difficult given his status as one of the world’s elite fighters with opponents especially reluctant to travel to Belfast. Santa Cruz has agreed to a rematch with Abner Mares in September, ruling both out for Frampton, while Selby is obliged to face his mandatory challenger, Jhonny Barros. “Nobody wants to fight him because he is one of the best fighters in the world,” explained McGuigan. “He lost marginally to Leo Santa Cruz, but he is still one of the elite pound-for-pound fighters in the world so we need to keep him busy. “He said he wanted to come back to Belfast and we have honoured that. We are here, but you never know, this might be the last time you see him in Belfast because of the nature of these fights now and the money that needs to be generated to put them on. Regardless, Belfast will once again be in the grip of Frampton fever come the end of July with tickets, as anticipated, snapped up in double quick time when they went on sale at 10am this morning (Thursday). “The whole buzz around the city on fight week is great,” said the North Belfast man. He repeated his disappointment that Leo Santa Cruz didn’t stick to the promise made in Belfast at a press conference last year to fight in the city, but for now ‘El Terremoto’ is out of his gaze as he focusses on the job at hand in Gutierrez. “Initially after he (Santa Cruz) beat me, what he was saying before the fight about coming (to Belfast) definitely changed quickly,” noted the 30 year-old. “I understand why he didn’t come. He has just won the title. The money he gets paid in the States means it needs to be a pay-per-view show (here) and there wasn’t a pay-per-view date available this summer. Carl Frampton paid tribute to his old training partner, Ryan Burnett who claimed the IBF bantamweight title at the weekend with his points win over Lee Haskins. ‘The Jackal’ said he was impressed with how his fellow North Belfast man dealt with the occasion on Saturday night plus ignoring the nasty gash on his forehead in the second round to power on and claim the title he craved. “Ryan did fantastic,” said Frampton. “A lot of things happened in that fight he had to deal with. The cut was a nasty one, but the corner did a great job. “A lot of fighters might have flopped in that situation. He stuck to the game plan. I found it difficulty to give Lee Haskins any rounds. I thought it was a shut out, but Haskins deserves credit for staying in there with that injury.